Living in London – London Cabs and Taxis. An Overview. London is a big city and while you might be tempted to buy a car to get around, you’ll soon find out that it is far easier if you use the myriad of efficient and excellent public transport that is available. Most people who consider moving will be able to get around easily and safely using the taxis that can be found on every corner. The buses and tubes do not run on a twenty-four hour basis and if you are doing some late night partying then you’ll want to be able to get home in the wee hours of the morning. As an iconic sight as a red double-decker bus, the famous Black Cabs are an intrinsic part of life and the local experience. Called ‘black cabs’; these days they come in a wide array of bright colours and designs and can be hailed in the street, at one of the designated ranks and at many stations. The most fascinating and famous feature of the ‘black cabs’ is the cabbie’s ability to calculate the quickest route to any destination without the use of fancy sat-nav technology. 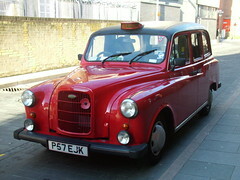 This is known as ‘The Knowledge’ and has been part of every London cabbies rigorous training programme since 1865. If the TAXI sign on the front of the cab is illuminated then the cab is for hire and all cabs have licence numbers and badges to ensure your safety while travelling around the city. Fares are metered and there is a £2.20 minimum charge. There are also private taxis, anything from a mini-cab to a limousine, but be aware that they have to be pre-booked. This is to ensure that all mini-cabs are legal, insured and licensed. Unbooked mini-cabs are illegal and don’t get into a cab that approaches you on the street as they are not licensed. Stay safe and stay sharp, for all its charm it is still a big city. In a service provided by Transport for London, you can text CAB to 60835 from your mobile phone and you’ll get the numbers of 2 licensed minicab firms and 1 Black cab. Your location is plotted by GPS! Living in London will be one of the most interesting times in your life, and the easiest way to adjust as fast as possible is to really immerse yourself in the way of life that most Londoners lead. Making your way around the city is easy and not as complicated as it might first seem. All you need is some gumption to get out of your new rental apartment and the city will be on your doorstep. Getting out and about is the perfect way to meet people and discover all that London has to offer.